Spanish historians and antiquarians in the sixteenth and seventeenth centuries revised the medieval reception of Islamic monuments in the Peninsula as architectural wonders and exotic trophies. They endeavoured to re-appropriate these hybrid architectures by integrating them into a more homogeneous cultural memory focused on Spain’s Roman and Christian past. These early modern interpretations of Spain’s Islamic monuments may have been pushed aside by the cultural and ideological power of the modern Orientalist myth. However, awareness of those early modern discourses is significant because they did not vanish overnight, but merely became superficially less visible. These sixteenth and seventeenth ideas re-emerge now and again, reconstituting the readings of Islamic architecture that arose in the wake of the taking of Granada. Once the conquest and conversion stories had been told, Aljama mosques had begun to be called cathedrals (iglesias mayores). The possibility of their being pre-Islamic foundations had started to be entertained. The endurance of these old Christianizing and antiquarian arguments is probably a consequence of the parallel survival of the agenda that gave birth to them almost 500 years ago. For the past few decades, Córdoba Mosque has been an ideological micro-battlefield where popular perception of Spain’s multicultural Islamic past and the Christian essentialism of the bishops and clergy responsible for the building cross swords. Consciously or otherwise, the latter have echoed, word for word, the Christian appropriation arguments created in the Early Modern Period. The cathedral chapter, for instance, has fostered academic research into the primitive Visigothic church that may or may not have stood on the site of the mosque. In the meantime, tourist information on the monument issued by the Church today refers to the Islamic construction as an interruption in the temple’s Christian nature and history. This attempt to interfere with visitors’ interpretation of the building, when most of them are precisely seeking encounters with the Islamic past, is usually unsuccessful and many find it preposterous. It can be understood as an example of the staying power of sixteenth century thinking. 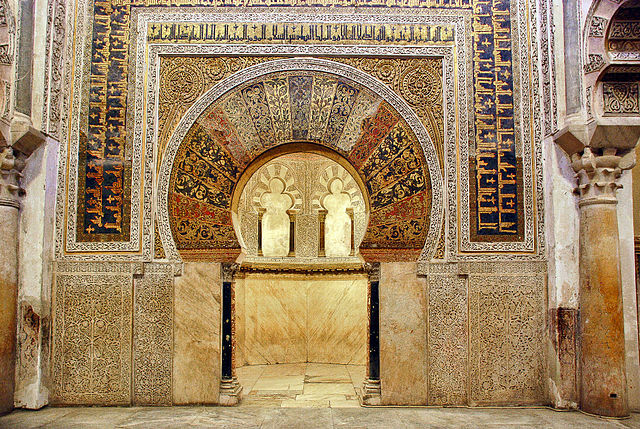 Mihrab of the Mosque–Cathedral of Córdoba by Ruggero Poggianella. CC BY-SA 2.0 via Wikimedia Commons. Seville’s Giralda, formerly the minaret of the Aljama Mosque and today the cathedral’s belfry, enjoys an iconic power that goes well beyond its original Islamic identity. This is a consequence of several centuries of narrative emphasis on the metonymic identification of the tower with its patron saints as the visible embodiment of the city. While the Christian genii loci incarnate, the presumed eternal spirit of a city dominated by Catholic liturgy, the Islamic builders are but a small part of a mythical discourse in which the issue under debate is not religion. Since the nineteenth century, Seville’s romantic exoticism has never been essentially or exclusively Islamic. Lastly, in Granada, the sixteenth century debate on the model of inter-confessional religious coexistence is today livelier than ever. Washington Irving’s legacy seems to have obliterated all possibility of escaping the city’s natural identification with Islam. Even as it benefits from this image, however, local identity has never abandoned the Christianization discourse. Granada holds its controversial celebration of the Christian conquest year after year, and the myth of the Sacromonte Lead Books still thrives in the twenty-first century because some of the population believes that both narratives are necessary to counter the dazzling power of Granada’s Islamic heritage. These strategies were designed many years ago because, like other buildings of al-Andalus, the Alhambra was an icon that made it impossible to ignore the nation’s hybrid past. Generally speaking, Spain’s Islamic legacy is more alive today than ever as a cultural and tourist commodity for international consumption. It is also at the heart of the multiculturalism debate that arose in the wake of 11 September 2001. This background feeds, to this day, the need for ideological negotiation through the monuments that embody our memory of the past. Featured image credit: Mosque–Cathedral of Córdoba by Alonso de Mendoza. CC BY-SA 3.0 via Wikimedia Commons. Antonio Urquízar-Herrera is Associate Professor at the History of Art Department of the UNED, Madrid, as well as Life Member at Clare Hall, University of Cambridge. 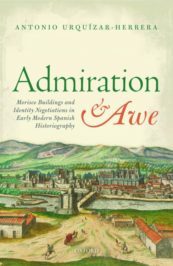 He has published several monographs about Early Modern Art in Spain, among them Admiration and Awe: Morisco Buildings and Identity Negotiations in Early Modern Spanish Historiography and Coleccionismo y nobleza. Signos de distinción social en la Andalucía del Renacimiento (Marcial Pons, 2007). He has also published more than thirty book chapters and articles in International and Spanish peer review journals. He has been principal investigator of a number of different research groups and research projects on Early Modern Art in Spain.